While a majority of people believe what the tube has to say about what is going on in the world buying all that passes off as current affairs, the truth remains largely unknown ... concealed behind all the repeated lies and deception in the mainstream media. For most part anyone who hasn't delved into the facts surrounding 911 and this whole war on terror facade is living a reality designed to keep the masses under a cloud of uncertainty by feeding us stories with no basis or validation, often retracted and contradictory statements are evidence of all the lying that passes off as headlines in our mainstream media networks. 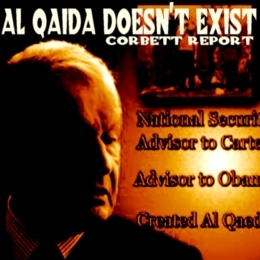 The official story behind Osama Bin Laden and his so called Al Qaeda Terrorist Network is all smoke and mirrors, designed with the intent to keep the public from knowing the truth, while creating animosity among religious groups ... creating chaos and confusion with all the deception and lies. However, in the times we're living in, it's easy to know the truth from mass propaganda when one is living from the heart. The truth is emergent and is changing our world view and this change in our individual world view is bringing about this collective change we envision as a society united, without boundaries and limitations. Al Qaeda Doesn't Exist is a documentary by The Corbett Report. It interrogates the theory that Al Qaeda is a centrally-operated terrorist organization run by Osama Bin Laden that perpetrated the attacks of 9/11. The documentary looks at Al Qaeda's roots, its ties to western intelligence agencies and the fictions that have been created to enhance its myth in the corporate-controlled media.